Saturation diving in the North Sea is a world of experience that most of us know nothing about. One of the divers in Alex Parkinson and Richard da Costa’s new film Last Breath, in UK cinemas this week, describes as going to space but underwater. The divers have to enter specially pressurised capsules in the ship for days at a time in order to acclimatize to the pressure, before descending to the sea bed to carry out maintenance on underwater pipes, drills and rigging. In the cramped conditions they take their bags of food and goodies and entertainment to pass the time. The helium rich atmosphere gives the everyone cartoonishly squeaky voices, but what happened on this particular routine job soon turned deadly serious. A commercial engineering ship – the Topaz – was in the midst of some bad weather when three divers descended in a diving bell to carry out some repairs. One of the divers Dave Allcock stays in the bell while the two others, Chris Lemons and his more experienced colleague David Yuasa – nicknamed the Vulcan because of his inhuman sangfroid – enter the water and proceed to the job. The pressure is ten times normal and the temperature is marginally above freezing and there is no light, which is all normal. However, when the computer fails that is supposed to lock the Topaz in position above them, the routine job becomes a life-threatening nightmare. With the ship drifting out of control, the men have to chase the diving bell which is being pulled along after the ship. Unfortunately, Chris’ umbilical line – which provides him with air, communication and heat in the 4 degree waters – becomes trapped and then breaks. 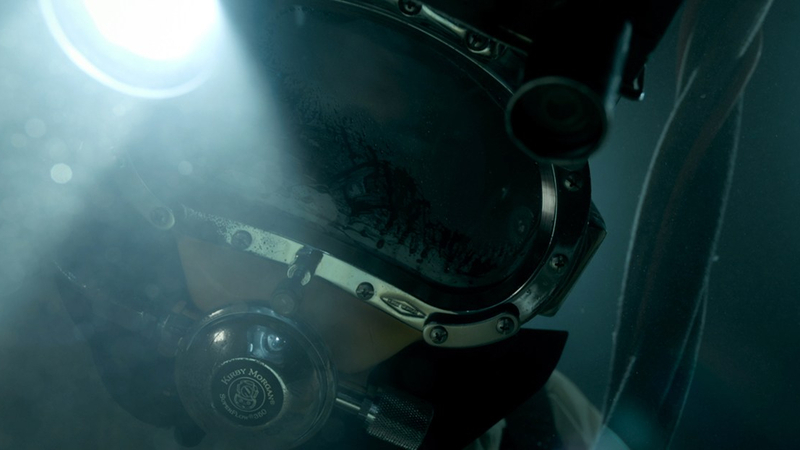 With only five minutes in his reserve tanks, the surviving divers and the men on board the ship must battle against the elements and race against time to find solutions that will help them find and rescue their lost man. The filmmakers use a combination of first hand accounts – Allcock makes for a particularly fruitful interviewee with his big bag of chocolate bars – black box audio, helmet video and reconstructions to reenact the drama of their story. The latter employ much extreme close up footage so as not to demand any acting skills of the participants. Fortunately, Chris was communicating with his fiance via a series of video diaries that he kept on board the ship and so we have an opportunity of getting to know Chris prior to the incident and his immediate likeability comes over well. The only quibble is that the filmmakers are so intent on providing a very guessable last-minute twist that the narrative sleight of hand becomes distracting. They should have more confidence in the value and the appeal of the story they are telling because it is a fascinating one. Not only for the incident but for the weird world in which these men live and the strangeness of a job that seems them routinely put themselves in such danger. Last Breath makes for a very decent entry into the survival genre of films like Touching the Void with the added appeal of the submarine movie and all the claustrophobia and intensity that comes with that. The score Zimmers along nicely, adding to the slick thriller-like editing and the world it reveals is one which deserves more attention.